Fresh basil is so yummy in many recipes--but it would always get black, mushy/slimy or dried out in the fridge vegetable bin before I could use the entire bunch. 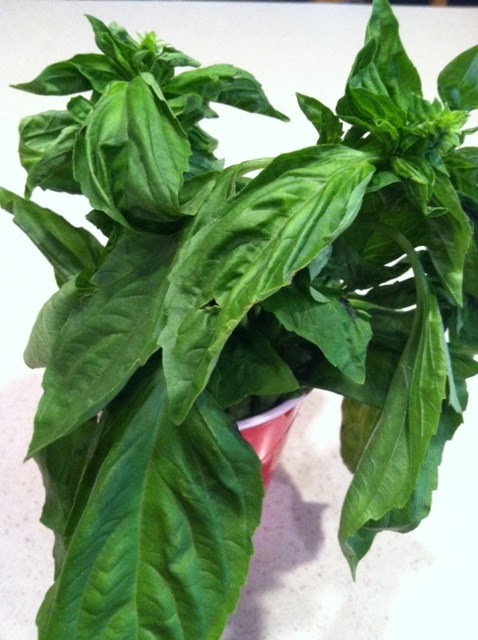 Then I heard about different ways to keep fresh basil--from cutting up, putting in ice trays, filling with water and freezing...to keeping between damp paper towels in a ziploc bag in the fridge. I haven't tried either of these methods--because honestly, who has the time to do this? I got tired just thinking about filling up those ice cube trays. Then I found a simpler way to keep basil. Treat basil like a flower and cut about 1/4-1/2" off the bottom, keep it in a cup with about 1" of water away from sunlight, and it will stay fresh and ready-to-use for up to two weeks! Every 2-3 days trim the bottom again to aid water absorption.